The NAMA Boot Camp will take place August 17-19, 2010 at the Hyatt Regency Crown Center in Kansas City. Come in early and attend the optional MoKan Ag Tour! All Boot Camp attendees will receive a notebook packed with ag terminology and facts as well as case studies and speaker presentations. NAMA’s next webinar, Managing an Effective Exhibit Marketing Program, will take place at 1:00 p.m. (Central time) on Thursday, June 24. Round up several people into a conference room, bring your lunches, sit back and enjoy the webinar. Many factors, from design to logistics, contribute to making a powerful impact at the show and result in exhibiting success. Cyndi Treadway, with Exhibit Resources, will suggest some strategies to meet the challenges of today’s agri-business event marketing program. The registration fee for the webinar is $50. Cancellations three or more days prior to the event are entitled to a full refund. To register for this webinar visit http://www.nama.org/ConferenceRegistration/Default.aspx?confid=21. The deadline for submitting nominations for the 2010 Professional Development Awards of Excellence is now July 20. 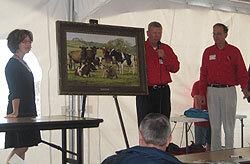 The awards will be presented at the 2010 Trends In Agriculture meeting which will be held October 5-6 rather than in November. To download the nomination form in an Adobe .PDF format, visit http://www.nama.org/awards/2010PDAapplication.pdf. Mark your calendars to check out an upcoming chapter event for the summer! Celebrating North Dakota Commodities ~ Northern Prairie NAMA invites you to a Wine & Cheese event on June 22 from 5:00 – 8:00 p.m.
Rodney Hogen, the owner of Red Trail Vineyards will be giving us a background on how to raise grapes in ND’s climate. Gary Hoffman, Executive Director of the ND Dairy Coalition will also be speaking about the current efforts of dairy producers. Navigating the Changing Ag-Media Market ~ This is a luncheon co-sponsored by the Florida NAMA chapter and Southeast AgNet in conjunction with the Florida Fertilizer & Agrichemical Association Summer Meeting. The meeting will include a delicious Luncheon Sandwich Buffet – Breakers Style; a brief annual report from UF/NAMA student chapter members; Ted Haller’s entertaining and thought-provoking talk, “Navigating the Changing Ag-Media Market,” will reveal cutting-edge audience research of high interest to the agri-marketing community and ag inputs industry leaders (CCA Professional Development CEU approved); and a Q & A session. Thanks to co-sponsorship from Southeast AgNet for this educational opportunity, your $60 admission fee will go directly to support Florida NAMA and the UF Student Gator-NAMA chapter. Gator NAMA is part of ongoing agri-marketing education at the university level in Florida, which needs the industry’s support. If not registering to attend as part of FFAA meeting attendance, NAMA members may RSVP and pay in advance for this luncheon by calling Southeast AgNet at 352-671-1909 or e-mail office@SoutheastAgNet.com. This years North Central NAMA Golf event is being held in conjunction with the 2010 Ag Media Summit Golf outing that is being held in St. Paul this year. We encourage NAMA members and guests to enjoy a day of golf and to participate in the Ag Media Summit events. 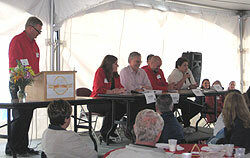 For a full schedule visit this link 2010 Agricultural Media Summit. The Golf Outing will take place at Keller Golf Course in Maplewood, MN. Cost for the outing is $125 per player ($500 per foursome) and includes: golf, cart, range balls, lunch and great prizes. To register online please go to the following link Golf Registration and you’ll find the golf registration toward the middle of the page or download the registration form (Microsoft Word format) and send or email it to me. If you have questions about registration please contact Bill Pool at bpool@fmid.net or at 763-257-6877. More than 130 dairy industry enthusiasts gathered at the Hoard’s Dairyman Farm in Fort Atkinson on June 8, to celebrate the 125th anniversary of the Hoard’s Dairyman magazine. It was in January of 1885 when William Dempster Hoard wrote his first issue of a “journal devoted to dairy farming” as a supplement to The Jefferson County Union weekly newspaper. A commemorative issue will be hitting mailboxes. On the cover will be artist Bonnie Mohr’s updated version of the famous “Foster Mothers of the Human Race” painting. During the event, panelists from all media avenues, discussed topics about communications changes and the challenges throughout the history of the dairy industry. The day wrapped up with a tour of the largest and longest continually registered Guernsey herd in the United States. The farm was recently expanded and added Jerseys in late 2009. Are you planning to implement or revitalize your trade show marketing effort? Many factors, from design to logistics, contribute to making a powerful impact at the show and result in exhibiting success. Cyndi Treadway, with Exhibit Resources, will suggest some strategies to meet the challenges of today’s agri-business event marketing program on the next NAMA Webinar, Thursday, June 24 at 1:00 p.m. (CST). About the Presenter: Cyndi Treadway, Exhibit Resources, Inc.
Cyndi’s experience includes more than 15 years with Exhibit Resources as Senior Account Manager and currently as director of Client Services in addition. Cyndi and her dedicated team manage over 100 trade shows and events. Registration fee: $50. Cancellations three or more days prior to the event are entitled to a full refund. Hoard’s Dairyman 125th Anniversary Celebration – Join the staff of Hoard’s Dairyman and the Badger NAMA chapter as they celebrate 125 years of excellence in Dairy publishing. Enjoy lunch, networking and a panel discussion as leaders in Dairy media address issues in their ever-changing industry. Stay for a tour of the Hoard’s dairy facility. The cost is Free for students, $15 for NAMA members and $25 for non-members. To register and pay online visit – http://www.nama.org/store/index.php. If you do not wish to signup online, please contact Maria McGinnis to RSVP at mmcginnis@cals.wisc.edu. Increased Scrutiny in the Ag Industry ~ The agriculture industry is facing increased scrutiny. Now more than ever, many consumers are demanding to know exactly where their food came from and the conditions under which it was produced. How should the agriculture industry respond, and how can we as agri-marketers help our clients? Join us to hear comments from Bryan K. Blinson of N.C. Cattlemen’s Association on these issues and more. The event will begin at 4:30 with dinner followed by the guest speaker at 5:30 p.m. Cost is $15 for NAMA members and students and $20 for guests. For questions contact Courtney Beck at cbeck@merrellgroup.com or via phone at (919) 844-2708. Plan to attend our next meeting at the Normal Corn Belters on Monday, June 14th. The meeting and game will take place at The Normal CornBelters home stadium, The Corn Crib on June 14th at 4:00 p.m. Dinner will follow in the IL Corn Suite, with 7:00 p.m. ball game. Normal CornBelters staff will give a tour of the ballpark and talk about the stadium marketing plans, etc. Tricia Braid Terry of IL Corn will talk about the IL Corn Marketing Board’s naming rights sponsorship. Please RSVP to Tricia Braid Terry at tbraidterry@ilcorn.org by 12:00 noon on Friday, June 11, to ensure your spot in the suite and enough food. Marketing the Cedar Rapids Kernels ~ Join Cornbelt NAMA for a brief presentation from the Kernels Director of Community Relations on how they “market” the Kernels. The event also includes great seats for the Kernels vs. Snappers baseball game. Seating is limited so RSVP early! Cost is $15 for members and $25 for non-members. The cost includes game ticket, lunch and admission to the suite. Send your RSVP to Terry Reilly, Iowa Farmer Today at terry.reilly@iowafarmertoday.com. You will receive a reply confirming you have a seat along with additional details on where to pickup your tickets, directions, etc. Ohio NAMA Golf Outing ~ Ohio NAMA is pleased to officially invite you to Ohio NAMA’s summer event, scheduled for Thursday, June 17, 2010. It’s a day reserved to catch up with other Ohio Ag Professionals and enjoy a great round of golf with a lunch/networking session to follow. For reservations and tee-times, please indicate your attendance by Friday, June 4, 2010. To view the invitation for this event, visit http://www.nama.org/chapters/ohio-june-golf.pdf. To RSVP for the events, please contact Mike Krouse at (419)532-3130 ext. 1269 or via email at mikek@unverferth.com or contact Becky Anway at (614) 889-1309 or via email at becky@amgllcusa.com. The 2010 NAMA Boot Camp will take place August 17-19 at the Hyatt Regency Crown Center in Kansas City. The deadline for submitting nominations for the Professional Development Awards of Excellence is July 20, 2010. These awards will be presented at the 2010 Trends In Agriculture meeting, October 5-6, at The Marquette Hotel in Minneapolis, MN. How do you differentiate your brand against competitors with bigger budgets and marketing departments? Embrace who you are and play to it, according to the presenter at the Iowa Chapter’s last meeting on May 21. Shannon Latham of Latham Hi-Tech Seeds, an independent soybean, corn and alfalfa seed company based in Alexander, Iowa, provided a case-study look at how the company’s small-budget marketing and communications campaigns (including social media, internal and dealer communications) have created big time results. Shannon is responsible for the company’s marketing, communications and event planning initiatives that target internal and external audiences. Learn more by visiting www.lathamseeds.com, and check out Shannon’s blog at www.thefieldposition.com.